The Builder pane can be accessed under the View tab or by clicking the icon on the main toolbar. The Builder pane is used for creating and editing trackable models, also called trackable assets, in Motive. In general, rigid body models are created for tracking rigid objects, and skeleton models are created for tracking human motions. When created, trackable models store the positions of markers on the target object and use the information to auto-label the reconstructed markers in 3D space. During the auto-label process, a set of predefined labels gets assigned to 3D points using the labeling algorithms, and the labeled dataset is then used for calculating the position and orientation of the corresponding rigid bodies or skeleton segments. The trackable models can be used to auto-label the 3D capture both in Live mode (real-time) and in the Edit mode (post-processing). Each created trackable models will have its own properties which can be viewed and changed under the Properties pane. If new skeletons or rigid bodies are created during post-processing, the Take will need to be auto-labeled again in order to apply the changes to the 3D data. On the Builder pane, you can either create a new trackable asset or modify an existing one. Select either rigid body or skeleton at the bottom of the pane, and then select whether you wish to create or edit. Each feature will be explained in the sections below. For creating rigid bodies, select the rigid body option at the bottom and access the Create tab at the top. Here, you can create rigid body asset and track any markered-objects in the volume. In addition to standard rigid body assets, you can also create rigid body models for head-mounted displays (HMDs) and measurement probes as well. Select all associated rigid body markers in the 3D viewport. On the Builder pane, confirm that the selected markers match the markers that you wish to define the rigid body from. Click Create to define a rigid body asset from the selected markers. Prespective View (3D viewport): While the markers are selected, right-click on the perspective view to access the context menu. Under the Rigid Body section, click Create From Selected Markers. Once the rigid body asset is created, the markers will be colored (labeled) and interconnected to each other. The newly created rigid body will be listed under the Assets pane. Creating an HMD rigid body in the Builder pane. This feature can be used only with HMDs that have the OptiTrack Active HMD clips mounted. For using OptiTrack system for VR applications, it is important that the pivot point of HMD rigid body gets placed at the appropriate location, which is at the root of the nose in between the eyes. When using the HMD clips, you can utilize the HMD creation tools in the Builder pane to have Motive estimate this spot and place the pivot point accordingly. It utilizes known marker configurations on the clip to precisely place the pivot point set the desired orientation. HMDs with passive markers can utilize the External Pivot Alignment tool to calibrate the pivot point. First of all, make sure Motive is configured for tracking active markers. Under the Type drop-down menu, select HMD. This will bring up the options for defining an HMD rigid body. Under the Orientation drop-down menu, select the desired orientation of the HMD. The orientation used for streaming to Unity is +Z forward and Unreal Engine is +X forward, or you can also specify the expected orientation axis on the client plugin side. Hold the HMD at the center of the tracking volume where all of the active markers are tracked well. 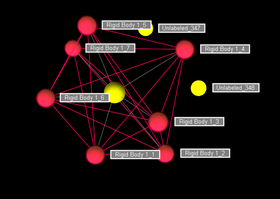 Select the 8 active markers in the 3D viewport. Click Create. An HMD rigid body will be created from the selected markers and it will initiate the calibration process. During calibration, slowly rotate the HMD to collect data samples in different orientations. Once all necessary samples are collected, the calibrated HMD rigid body will be created. Using the Builder pane, you can also modify existing rigid body assets. For editing rigid bodies, select the rigid body option at the bottom of the Builder pane and access the Edit tab at the top. This will bring up the options for editing a rigid body. Under View tab, open the Builder pane. Select the Rigid Bodies option at the bottom of the pane and go to the Edit tab. Slowly rotate the rigid body to collect samples at different orientations. The Probe Calibration feature under the rigid body edit options can be used to re-calibrate a pivot point of a measurement probe or a custom rigid body. This step is also completed as one of the calibration steps when first creating a measurement probe, but you can re-calibrate it under the Edit tab. In Motive, select the rigid body or a measurement probe. Bring out the probe into the tracking volume where all of its markers are well-tracked. Once it starts collecting the samples, slowly move the probe in a circular pattern while keeping the tip fitted in the slot; making a cone shape overall. Gently rotate the probe to collect additional samples. When sufficient samples are collected, the mean error of the calibrated pivot point will be displayed. Click Apply to use the calibrated definition or click Cancel to calibrate again. Options for translating and rotating the rigid body pivot point. The Edit tab is used to apply translation or rotation to the pivot point of a selected rigid body. A pivot point of a rigid body represents both position (x,y,z) and orientation (pitch, roll, yaw) of the corresponding asset. The OptiTrack Clip Tool basically recalibrates HMDs with OptiTrack HMD Clips to position its pivot point at an appropriate location. The steps are basically the same as when first creating the HMD rigid body. For using OptiTrack system for VR applications, it is important that the pivot point of HMD rigid body gets placed at the appropriate location, which is at the root of the nose in between the eyes. 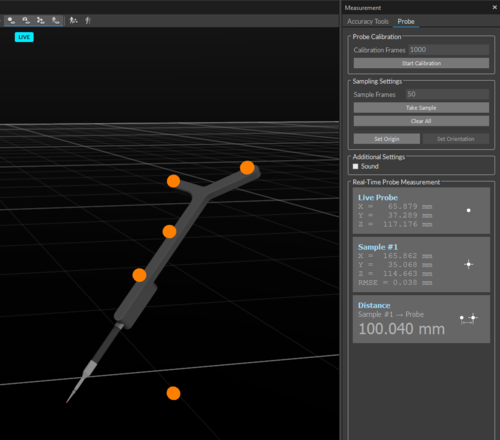 External Pivot Alignment tool utilizes both the OptiTrack mocap system and the HMD's own tracking system (Oculus Tracker / Vive Base Stations) for precisely calculating the location of the pivot point of an HMD. When using this feature, both systems must be tracking the HMD simultaneously. For Motive versions 2.1 Final and later: Oculus and Vive HMDs are supported. For older versions of Motive: Only Oculus HMDs are supported. 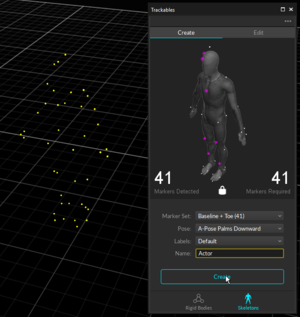 The corresponding native HMD tracker must be tracking the HMD along with the motion capture system simultaneously. For CV1 active HMD clips, the rigid body definition will be provided separately. First of all, connect the HMD Tracker (Oculus Tracker / Vive Base Stations) and have its corresponding software running in the background. [Motive] Create a rigid body asset from the markers on the HMD. [Motive] Open the Builder pane and access editing options for rigid bodies. [Motive] Select the HMD rigid body in Motive. [Motive → Builder pane] Under Detected Type, it should indicate Custom RigidBody. [Motive → Builder pane] Set the desired number of sample counts (Default: 750) and the desired orientation. [Motive → Builder pane] Press start to initiate the sampling process. [Motive → Builder pane] During calibration, make sure both the mocap system and the HMD tracker (Oculus Tracker / Vive Base Stations) is tracking the HMD. [Motive → Builder pane] Once it starts collecting the samples, point the HMD towards the tracker and slowly rotate it and sample different orientations. 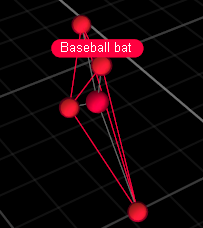 [Motive → Builder pane] When it finishes collecting samples, it will display the offset distance, in mm, between positions of the pivot point detected by the HMD tracking system and the motion capture system. [Motive → Builder pane] If the results are satisfying, press Apply to calibrate the HMD rigid body. This feature is useful when tracking a spherical object (e.g. ball). It will assume that all of the markers on the selected rigid body are placed on a surface of a spherical object, and the pivot point will be calculated and re-positioned accordingly. Simply select a rigid body in Motive, open the Builder pane to edit rigid body definitions, and then click Apply to place the pivot point at the center of the spherical object. 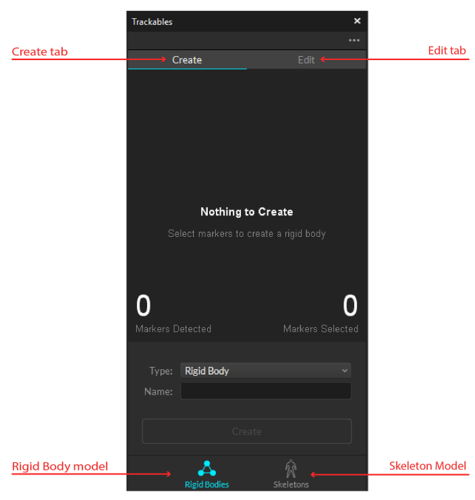 To create skeletons in Motive, you need to select the skeleton option at the bottom of the Builder pane and access the Create tab at the top. 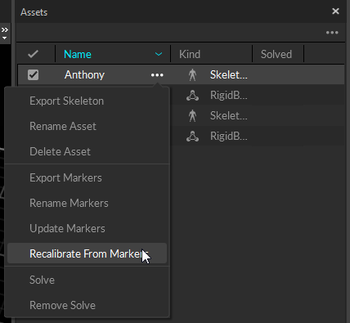 Here, you select which skeleton markerset to use, choose the calibration post, and create the skeleton model. Defining skeleton from a skeleton markerset. From the skeleton creation options on the Builder pane, select a skeleton marker set from the Marker Set drop-down menu. 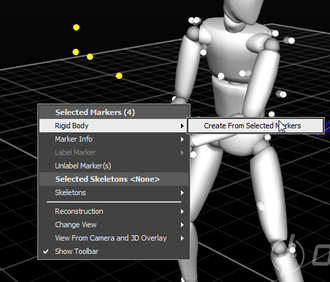 This will bring up a skeleton avatar displaying where the markers need to be placed on the subject. Refer to the avatar and place the markers on the subject accordingly. For accurate placements, ask the subject to stand in the calibration pose while placing the markers. It is important that these markers get placed at the right spots on the subject's body for the best skeleton tracking. Thus, extra attention is needed when placing the skeleton markers. The magenta markers indicate the segment markers that can be placed at a slightly different position within the same segment. Double-check the marker counts and their placements. It may be easier to use the 3D viewport in Motive to do this. The system should be tracking the attached markers at this point. In the Builder pane, make sure the numbers under the Markers Needed and Markers Detected sections are matching. If the skeleton markers are not automatically detected, manually select the skeleton markers from the 3D perspective view. Select a desired set of marker labels under the Labels section. Here, you can just use the Default labels to assign labels that are defined by the markerset template. Or, you can also assign custom labels by loading previously prepared marker-name XML files in the label section. Next step is to select the skeleton creation pose settings. 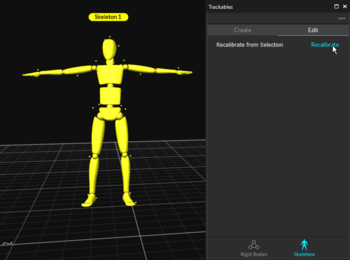 Under the Pose section drop-down menu, select the desired calibration post you want to use for defining the skeleton. This is set to the T-pose by default. Ask the subject to stand in the selected calibration pose. Here, standing in a proper calibration posture is important because the pose of the created skeleton will be calibrated from it. For more details, read the calibration poses section. Click Create to create the skeleton. Once the skeleton model has been defined, confirm all skeleton segments and assigned markers are located at expected locations. If any of the skeleton segment seems to be misaligned, delete and create the skeleton again after adjusting the marker placements and the calibration pose. If you are creating a skeleton in the post-processing of captured data, you will have to auto-label the Take to see the skeleton modeled and tracked in Motive. 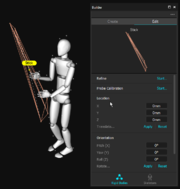 Skeleton markersets for VR applications have slightly different setup steps. See: Rigid Body Skeleton Markerset. To create skeletons in Motive, you need to select the skeleton option at the bottom of the Builder pane and access the Edit tab at the top. 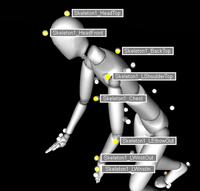 To recalibrate skeletons, select all of the associated skeleton markers from the perspective view along with the corresponding skeleton model. Open the Builder pane, and open the Edit tab while Skeleton option is selected at the bottom. Make sure the selected skeleton is in a calibration pose, and click Recalibrate. 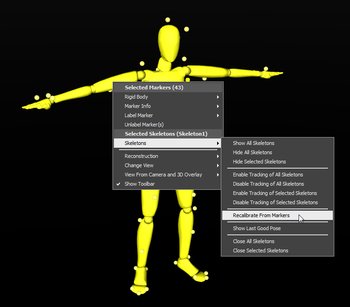 You can also recalibrate from the context menu in the Assets pane or in the 3D Viewport. This page was last modified on 11 February 2019, at 19:32.